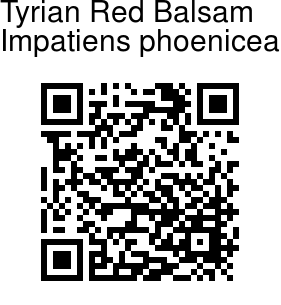 Tyrian Red Balsam is a beautiful and striking species from Southern Western Ghats, and has potential to be cultivated as a garden plant. It is a woody erect herb, 0.3-1 m tall, branched or not, hairless. Leaves are alternate, lanceshaped or ovate, narrowed at both ends, bristly rounded toothed-sawtoothed, incurved, 5-15 x 2.5-3.5 cm, dark-green, shining; leaf-stalks 1.5 - 2.5 cm long. Flower-cluster-stalks arise in leaf-axils, as long as leaves, slender, erect; bracts at base of flower-stalks, ovate, heart-shaped, persistent. Flowers are about 2.5 cm long, brilliant scarlet, yellow in centre. Lateral sepals obliquely ovate. Lip with spur blood-crimson, trumpet-shaped, incurved with swollen tip. Standard scarlet, broad, ovate. Wings scarlet, yellow at base, small; basal lobes heart-shaped, overlap-ping the larger oblong, distal lobes. Capsules are 4-5-seeded; seeds compressed-furrowed, about 3 mm long, light brown. 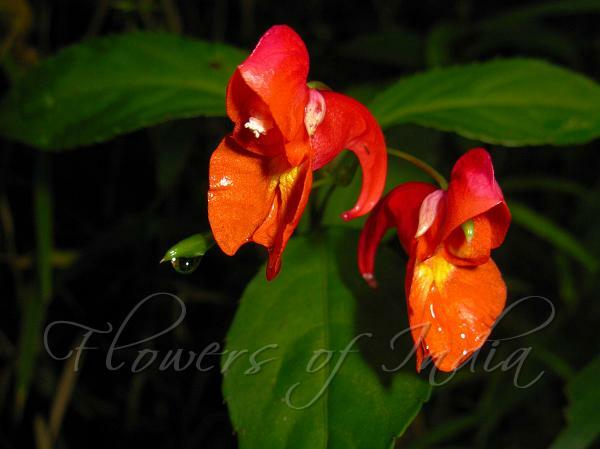 Tyrian Red Balsam is endemic to Southern Western Ghats, south of Pulneys and High Ranges of Kerala, sholas above 1,500 m, in Tamil Nadu and Kerala. Flowering: May-November.